Shizuka is a Japanese figure skater. She is the 2006 Olympic Champion and the 2004 World Champion. Shizuka began skating when she was five. She went to the ice rink and saw the kids with cute costumes. She thought "I want to wear that pretty costumes", this is why she started skating. She landed her first triple salchow when she was eight, and called "Child Genius". She was the first skater in Japan to win three consecutive junior national titles. tional in 1998 and 1999. When she was sixteen years old, she represented Japan in the 1998 Nagano Winter Olympics and finished at 13th. She won the Asian Winter Games and Winter Universiade during the 2002-2003 season. The following season, she won the 2004 World Championships in Dortmund, Germany. 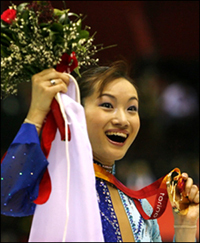 At the 2006 Winter Turin Olympics, she broke her personal best scores both in short program and free skating, and she became the first Olympic gold medalist in Asia. She is also the first Japanese skater winning both World Championships and Olympics. Shizuka is currently skating as a professional skater in Japan and also different countries.